Answer Garden is an interesting tool for gathering and representing data. You don’t need to resister to use it and it’s free. When you set up your answer garden, you have the option to moderate it and add a password. Once you’ve popped some answers into your Answer Garden, you get several options. One I like is to export it to Wordle, which makes a slightly different, (mostly coloured) word cloud from it. You can see my two coloured examples in the pic to the left. The grey word cloud below is the normal Answer Garden word cloud before you export it. It came from a screen grab. I love the way you can see at a glance the most popular responses. You can also export to Tagxedo, translate answers with Microsoft Translator, and tweet your results. I think Answer Garden makes a quick and easy to use tool for kids who want to canvas classmates’ opinions on something, or when they need to get a graphic representation of some answers to a question. The more times an answer is given, the larger its font will be, just like most word clouds. 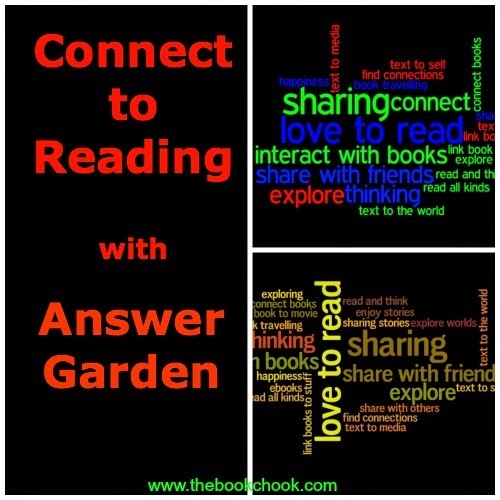 I decided to set up an Answer Garden on the theme: Connect to Reading. This might be a really useful activity for children to try during Children’s Book Week - perhaps they’re interested in finding out the most popular book in their class, or polling other students on their attitudes to reading. I decided to ask: what does Connect to Reading mean to you? I put in some responses manually I'd gathered from an oral poll, but you can receive answers online if you wish. The results can be embedded on a blog as I did below. (If there's a big space instead, you'll know the embedding didn't work!) You're welcome to choose your own response and add it to my Answer Garden, or via the poll lower down, but I will need to moderate before it is added. What does Connect to Reading mean to you?... at AnswerGarden.ch. You can also simply share a link to the Answer Garden. And last of all, there’s the facility to use Answer Garden as a poll. The answers show up in your AnswerGarden. If you’ve elected to moderate, then you will need to do so before they show up.